As Christian parents and teachers, our number one goal is to introduce our children to Jesus. One of the best ways to do this is to be loyal to the Bible. The Bible is our road map for life and is the definitive word of God given to us through His Holy Spirit. Use the following acrostic of the word “LOYAL” to help you stay on track while teaching it to your children. It is important that our children learn that the scriptures given to us by God will equip them for every good work that they will set their hands to. That is reason enough to be loyal to the Word of God. 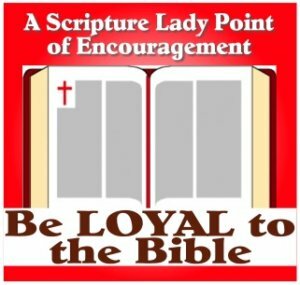 Let’s look at the acrostic of “LOYAL” to learn 5 reasons why we should be loyal to the Bible. In today’s culture, it is common to hear people say, “Truth is relative.” Agreed. Some truth is relative, but God’s moral truth is never relative. It is the unswerving truth that should be our standard throughout our whole life. Your children will be fed a lot of lies being masked as truth throughout their childhood. Teach them that if the Bible is their go-to standard, they will be able to discern what is right and good and true according to what God says and not according to the whims of a culture. James 1:22 says this: “Do not merely listen to the word, and so deceive yourselves. Do what it says.” (NIV) Obedience should be a term that is honored by all. However, over time, it seems to have become more like a four-letter word that is avoided at all costs. It is important that our children learn that obeying God is the BEST possible thing they can do. God will never tell them to do something that is not for their very best, even when it appears contrary to their logic. Romans 10:17 says this: “So then faith comes by hearing, and hearing by the word of God.” As Christians, we are called to speak the truths He has given to us. We are to do so with love and grace. However, we should not shy away from proclaiming what we know to be true in the Bible because it is not popular or because it may go against a culture’s belief systems. Teach your kids the importance of speaking the truths of God and their foundation of faith will grow. I will joy in the God of my salvation.” (NKJV) This is a beautiful verse that screams the need for loyalty to God and His Word. The Bible is full of hope and encouragement from beginning to end. But the Bible also paints a picture of reality of life that is second to none. We live in a world that is groaning for the return of Jesus and therefore, life has its many valleys as well as mountain tops. But when you teach your children to stay loyal to God and His Word, they too will be able to rejoice as He leads them on their journey. Psalm 119:97 says this: “Oh, how I love Your law! It is my meditation all the day.” (NKJV) This psalmist had a deep love for God’s Word. In fact, he states that he meditates on it all day long.” Wow! That’s loyalty. And while most of our days are filled to overflowing with schedules that make us dizzy, we too, should stop throughout our days and consider our love for God and His Word. Teach your kids to love the Bible. In fact, be the example to your kids of someone who can’t live without its life-giving words. Looking for other encouraging words for your ministry to children? Then click on this link to learn how to make your times of Bible instruction GREAT! If you liked this Creative Bible holiday song, then sign up to receive Scripture Lady’s Free Email Kid Tips packed full with creative ideas and receive 12 FREE Bible downloadable resources to help get the kids you minister to excited about the Bible! Just go to www.MyFreeBibleGames.com to fully subscribe.